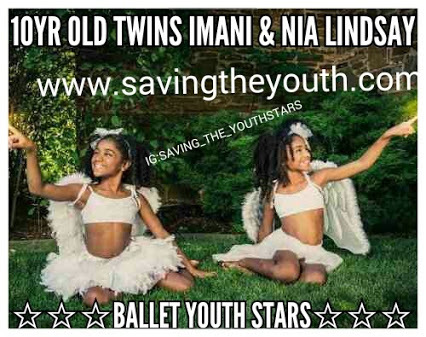 ☆☆☆YOUTH STARS SPOT LIGHT OF THE WEEK☆☆☆Shout Out to these two beautiful and talented young sistars Nia & Imani Lindsay!!! 10 year old Canadian twins Nia and Imani Lindsay are gifted and using their talents to explore their unlimited possibilities!! These two not only speak French and Spanish – they also earned a half scholarship to the “Young Dancer Summer Workshop” at the American Ballet Theatre, which is recognized as one of the world’s most prestigious dance companies!!! Way to go beauties!!! Hard work and dedication pays off!!! TURN UP 4 GREATNESS!! Posted in Saving The Youth Stars™Tagged Abundance, africa, African, Afrikan, Ancient, black, Dream Big, dreams, Education, excellence, fun, goals, God, growth, happiness, happy, health, inspirational, inspire, joy, Kings, knowledge, learn, learning, Life, love, Motivate, motivation, motivational, Peace, positive, Prosperity, Proverb, Ra, Save Our Youth, Sistars, spirit, spiritual, Star, success, teach, teen, Teen Queen, teens, thesaurus, Twins, wealth, wisdom, wise, words, youth, Youth StarsBookmark the permalink.